It’s been a bit since I could say that an issue of The Flash was a pure joy, but this issue fulfills that billing and more. 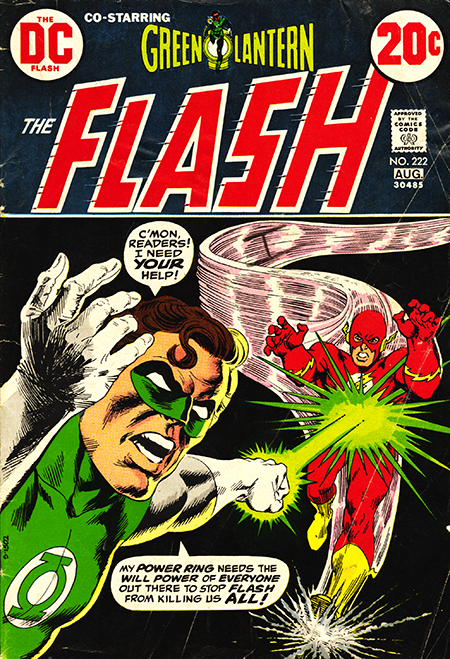 To start with, we’ve got a terrific Nick Cardy cover announcing a Flash/Green Lantern team-up story. Still not a fan of boxing off the logo, but it’s a great cover nonetheless. Inside, in a story that would not have felt out of place in the least in the early sixties, Cary Bates channels his best Broome/Fox era story yet as the Flash and GL battle the Weather Wizard and Sinestro. The tale opens with Sinestro the rogue Green Lantern paying a visit to an old character from back in the day with one of the greatest conceits for a character ever in Paul Gambi, the tailor to the troublemakers. The concept created an immortal wound the moment I saw it. I loved the fact that there was someone who was behind the creation of all of those wonderful swashbuckling costumes. It answered a lot of questions really. The flamboyant apparel certainly wasn’t off the rack, and every Flash villain couldn’t have been an adept seamstress, so the existence of Paul Gambi made a lot of sense. I have to admit that I was also jealous at the time of the fact that Julie Schwartz had named Gambi after a frequent Flash-Gram contributor. I believe I discussed all this in an earlier blog post so, if you’re interested in more detail, please go back and read the blog from the beginning until you come to it. Like I’ve said, not a research paper. Teeny little secret here, just to show you how much I loved the conceit, I stole borrowed Paul Gambi to use in Funky when John Howard, the owner of the Komix Korner was picking up some threads for his date with his future wife Becky. Let’s just keep that between us, ok? I’d tell you to start reading the Complete Funky collection until you come to that bit, but, alas, the books aren’t quite there yet. So, anyway, Sinestro is visiting Gambi because he wants to locate the Weather Wizard so that WW can blanket the Earth with a planet covering cloud to keep Sinestro from the prying eyes of the Guardians. In turn, the libertine Lantern offers to help the weather wiz remove the Flash from his to-do-in-list. Green Lantern enter the fray when he realizes that Sinestro is on Earth. Together the Flash and GL battle their frightful foes just in time for the Broomian close where Barry (the Flash for any newbies) arrives home just in time to celebrate his anniversary with Iris. Cary Bates had learned his lessons well. On the Flash-Grams page, the readers all pass out the kudos for the Flash’s return to form, and I stand in line to applaud with them.